For this roll cake of mine, I took the Sprinkle Bakes recipe and I once again baked it in a 9x13 inch pan. This cake has only 2 tablespoons of flour in it and I wanted to add a bit more to try to firm it up a bit for rolling. In the end, I was too scared to add more than an extra teaspoon of flour to the batter because I was concerned that too much would ruin the lovely moist texture. I could probably have gone with a bit more. This recipe will make a a small roll cake, yielding 4 to 6 modest servings. For the filling, I started by whipping up some heavy cream, which I just very slightly sweetened since the red bean mixture is already sweet. I whipped 3/4 cup of whipped cream but wound up with quite a bit of filling leftover so I've reduced the amounts in the recipe below and I'd go with 1/2 cup of whipped cream next time. For the red bean part of the filling, look for canned prepared sweetened red beans, as shown below. You can find it in Asian grocery stores. The red beans are cooked with sugar, soft and sitting in a thick paste. I was worried about too much liquid in the filling so I placed the red beans in a sieve and mashed about half of it. I removed some of the excess liquid that pushed out through the sieve but not too much because I find you do want some of that thick liquid to sweeten, flavor, and tint the whipped cream. Mashing the red beans also lets the red bean flavor incorporate better into the cream while seeing bits of whole red beans in the filling lets you know what you're getting. The picture above is not the prettiest but it shows what was happening in my kitchen. When the cake came out of the oven, I turned it out onto a clean tea towel to roll. My mistake was placing the cake near the center of the towel instead of at the top; that wouldn't be a problem if I could easily move the cake but since it's not easy to lift up and move (maybe dusting the towel with matcha powder would've helped but I didn't want to waste that much matcha), I double-folded the towel at the top before I starting rolling the cake up, and that thicker part of the towel cut into the cake and ripped it in one section. When the cake cooled to room temperature (doesn't take long), I unrolled it (slowly because the bottom does stick to the towel but will remove pretty easily nonetheless) and placed it on top of a piece of parchment paper before spreading on the red bean cream filling. Finally, I carefully rolled it back up and dusted the top with a bit of matcha powder. The roll cake can sit in the fridge until dinnertime. Remove it from the fridge during dinner to bring it to room temperature before slicing and serving. This cake is fragile but oh so light, soft, and moist. The green tea flavor is very subtle but I think it does temper the overall sweetness. You definitely get almonds from the almond meal in the cake itself and the sweetness from the red beans makes for a nice package. We really enjoyed this little roll cake. I think I'm now ready to tackle roll cake recipes now should I feel the urge (and if anyone else feels the urge to post a roll cake recipe for the holidays, I'd like to request a video)! Pour batter into prepared pan. Use an offset spatula to evenly distribute and even out the batter across the pan (be gentle so as not to deflate the batter). Bake for about 5-6 minutes; cake will be set and a cake tester comes out clean. Keep a close eye on it and do not overbake. Remove cake from the oven. Run a butter knife around the edges of the cake and carefully invert it on top of a clean, thin kitchen towel. Position the cake so that the short end will settle near the top edge of the towel. Gently remove the parchment paper attached to the cake. Carefully roll the short end of the cake together with the kitchen towel. Let sit, seam side down, until fully cooled to room temperature. Make red bean cream filling: Place prepared red beans into a fine sieve. Mash about half the beans with the back of a spoon. Remove some of the liquid that has been pushed through the sieve. Place the beans into a small bowl and stir together. Place heavy cream in a bowl of a stand mixer fitted with the whisk attachment (or use a handheld beater). Start beating the cream. Gradually add sugar, then vanilla extract. Continue to beat until cream reaches stiff peaks. Fold the red beans into the whipped cream. Assemble roll cake: Set a piece of parchment on a work surface. Unroll the cake on top of the parchment (go slowly since the bottom of the cake will stick to the towel but does release). Spread the filling over the top of the cake, leaving about a 1/4 inch border. Starting at the short end, roll cake into a log, using the parchment to help you along. Set cake on a serving plate, seam side down. Place in the refrigerator for about 30 minutes or until ready to serve. Before serving, bring cake to room temperature. Dust the top with a bit of matcha powder, if desired. Slice and enjoy. Red bean and matcha are both my favourite. The roulade looks light and beautiful. It is a great combo of the sweet and the slightly bitter. Thanks! Oh yummy! And the sponge is such a nice color! I love the color of matcha in baked good, too. I am all over these delicious flavors. Love matcha and red bean and i never had it mixed in cream before. I bet that made it light and delicious. You so talented always making cakes and ones that are a little difficult like a roll cake... Have a super weekend! The whole thing just melts in your mouth...maybe a little too well! This cake roll sounds so delicious, it is definitely on my to do list for the weekend! The presentation is stunning. I wish I had a slice right now! Glad you like it...that touch of matcha makes it special, I think. I love the sound of the beans in the icing! What a nice idea, lovely colour on the sponge too. Hope you are doing wonderful girl. That roll is everything I love in a cake. The matcha, the red bean and almond, yum yum yum. Its a great combination of flavors for sure. I've never had red bean with almonds, quite intrigued. I am sure everyone enjoy every bite. I am off to read you last week's post. Hi Jo!! So, so great to hear from you. How are you?! What awesome flavors! That filling sounds wild :) So unique! Thanks, Medha. You can find the prepared red beans in Asian food stores pretty easily and I love eating a red bean ice (think red beans, milk, ice all blended up) growing up so red beans have a special place in my heart. My sister also loves all desserts with matcha. It is a nice balance to the sweetness. Thank you! You did a beautiful job rolling that cake - this is so unique and beautiful and it looks so moist - I have to try the matcha - and the sweet red bean filling - fascinating! Thanks for sharing this recipe - you out did yourself Monica! Thanks for being so generous with your praise, Tricia, especially since my desserts are like slapped together haphazards compared to your composed, meticulous treats. I do appreciate it. Have a great weekend! Hi Monica, fabulous job with this roll cake, love the spices you used and the red bean filling sounds amazing. Thanks, Cheri. I did the best I could. At some point in my life, I decided not to sweat details and just give things a try and see how it goes! 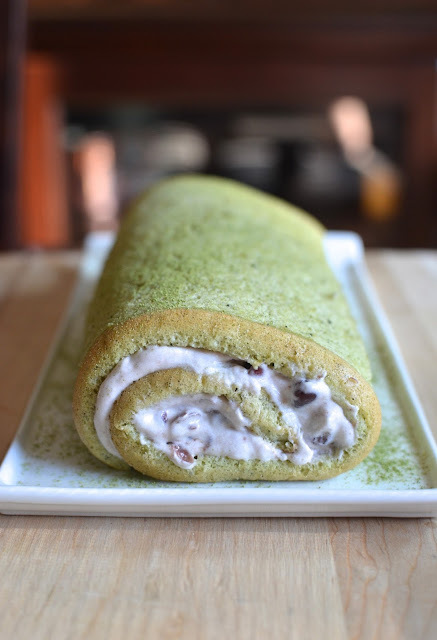 I miss matcha bakes so much, this roll cake looks so gorgeous and delicious! What a pretty cake! Roll cakes are so fun, I really need to try making another one sometime :P Love the red bean filling, sounds delish! serving it half frozen will be grat i think!!! looks damn fancy n delicious! Oh I love the idea of a whipped red bean filling for this matcha roullade; you did a wonderful job! Thanks, Monica. It wasn't hard and we polished it off quickly. OMG, I am in LOVE with the flavor combination! This roll cake looks so good and for the first attempt, this looks PHENOMENAL! Trust me, when I first attempted roll cake, it ended up going toward making trifle! It looked devastating! I need to give this a try now! Hi Monica, this is magical, whipped red bean filling, oh my goodness I bet this is delicious!